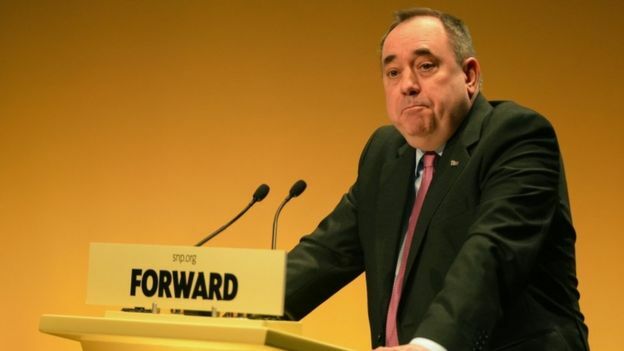 Former Scottish First Minister Alex Salmond has appeared in court in Edinburgh. Police Scotland had earlier confirmed that a 64-year-old man had been charged and said a report would be sent to prosecutors. It still is not yet known what charge Mr Salmond faces. However, outside the court he said he was “innocent of any criminality” and added he would defend himself “to the utmost”. Police had been investigating following a Scottish government inquiry into complaints of sexual harassment against Mr Salmond, which he denies. Mr Salmond, who was first minister from 2007 to 2014, was interviewed by police on Wednesday. He arrived at Edinburgh Sheriff Court shortly before 14:00 on Thursday for a short hearing. The news comes two weeks after Mr Salmond was at the Court of Session in Edinburgh, where the Scottish government conceded that its internal investigation of the complaints against him was flawed. The former first minister had launched a judicial review against the government he once led over how it had handled its inquiry, saying he had been treated unfairly. That case was focused on the government’s processes, not the substance of the complaints – which Mr Salmond has denied.